With newborn son, will Brantley have even more ‘daddy strength’ in 2015? 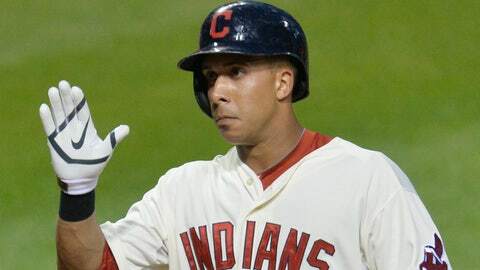 Indians outfielder Michael Brantley hopes to have more cause for celebration after an impressive 2014 season. GOODYEAR, Ariz. — En route to doubling his home run production last season, Michael Brantley often smiled and said "daddy strength" was the reason for the increased power numbers. If he gets off to another strong start in terms of home runs, Brantley might say daddy strength times two. Brantley’s wife, Melissa, gave birth to Michael Charles Brantley III on Feb. 10. Brantley’s daughter Mariah is 17 months old. "I was carrying that car seat on one side and holding my daughter walking on the other," Brantley said. "I had to alternate at times and make sure the core work was not all on one side." Plus Brantley will have the double stroller if he wanted to get increased cardio work. There’s also no word yet if the youngest Brantley will go by Michael or Mickey. "We haven’t really discussed that yet," said Brantley about the talks with his father. "All I know is he is happy to have another grandson." After signing a contract extension right before the start of spring training last year, Brantley enjoyed a breakout season and finished third in voting for American League MVP. He was the first player in franchise history to have 200 hits, 45 or more doubles, 20 or more homers and 20-plus stolen bases in the same season and the ninth in MLB history. Before last season, Brantley’s previous high in home runs was 10 in 2013, but he surpassed that by mid June and had 15 at the All-Star break. Throughout last season, manager Terry Francona thought that Brantley had a stronger base, which allowed him to have increased power. With a newborn arriving right before the start of spring training, Brantley has not had a chance to talk to his father about the biggest thing to improve upon going into the season. Last year Mickey Brantley told his son to be more aggressive on the first pitch. According to STATS LLC, Brantley swung on 21.9 percent of first pitches last season compared to 17.8 in 2013. With position players having their physicals and meetings with the coaching staff on Monday, Brantley was happy to be back in the clubhouse at the team’s player development complex. The first full-squad workout will take place on Tuesday. "I think it is just like opening day. It is the first day you can put on your pants and uniform top and be around all the guys," he said. "It is kind of like that first game of the year where you have those jitters and can’t wait to get started." When asked what they talked about during their meeting, Francona said that Brantley had the same approach — polite, consistent and respectful. The one thing that might be different this year is that Brantley might have a better understanding on how much he is being looked at as a leader. "He’s a real good player who wants to get better," Francona said. "He really understands how much people look up to him because of how he goes about his game and the more of a voice he has in there (the clubhouse) the better." As for when the Indians might start scouting Michael Brantley III, Francona smiled after being asked the question and said "pretty good gene pool."